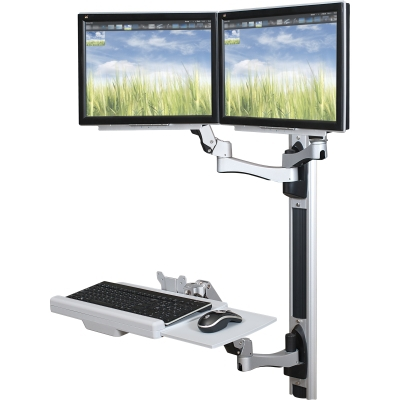 The HG Wall Mount Workstation is the most versatile "set and forget" wall mount workstation available, featuring a wide range of one touch adjustments with no buttons, knobs, levers, or switches. Use just one hand to adjust tilt, swivel, and pan on each of the arms. Spring-loaded joints ensure the arms stay in place, yet are easily repositionable. Ideal for use in medical facilities, warehouses, or other high traffic areas where computer access for multiple operators is needed, this space saving station has a comprehensive array of adjustment ideal for virtually any user. 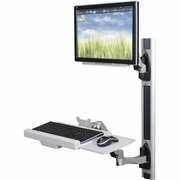 The base unit includes a single monitor mount and a keyboard arm. Optional additional monitor arm and CPU holder available. Each accessory attaches by sliding onto the base. You choose where to lock each part into place. Base and components include cable management channels to keep cords out of your way. The dual-jointed adjustable keyboard arm features height adjustment, lateral adjustment, and tilts for ideal positioning. Keyboard tray measures 18.25"W x 10"D and includes a retractable mouse platform (8.5"W x 8.38"D) that can be used on the right or left side. Folds to 22.87"W x 7.91"D when not in use.